Wow, this week was beyond good. It's incredible to see how the Lord has blessed us for all of our efforts! This week we met two new Hispanic investigators and they are both such swagsters. haha! Both of them met a few times with the missionaries in the past but weren't able to visit very often because of their work schedules. The first guy is named Douglas, and he's 26 and from España. The first Spaniard I've met here! He is pretty jacked and decked out with tatoos, so he seemed tough at first, But, once he opened up to us he turned out to be quite the hermano. He's super solid and loves learning more about our beliefs. He does have some conflicts with family but he said his work schedule changed on Sundays so hopefully he can start coming to church! The other guy is named Christian, and we had an appointment fall through so we noticed in our area book that he lived close by. So, we stopped by on Thursday to try to see who he was. We knocked on the door and out peers this super pale short man with some wavy blonde surfer-dude hair and we were taken back a bit. We were like,”Hey, sorry to bother you, but is there a Hispanic guy that lives here named Christian?” He said, "Yeah, yo soy, It's me.." And we were like whaaat!? Hahaha! Seriously, the whitest Hispanic I've ever seen. He told us his friends always tease him and call him 'Donald Trump Jr.' 😂. Lol, pretty funny. Anyway, Christian is from Ecuador and we talked to him a lot about what he knew about us. For his college class, he learned all about the church for a project he had and he knows so much! He definitely has a logical testimony of the restored gospel, but now we hope we can help him gain a spiritual testimony. 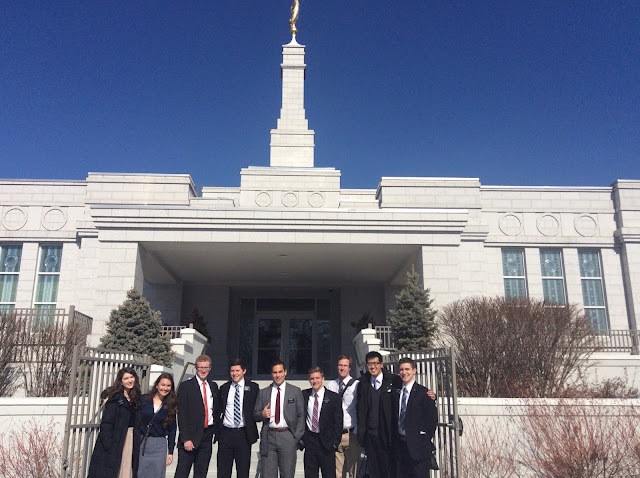 On Saturday, we had the privilege of going to the temple again! One of the converts in the YSA Ward got to go for the first time, so we went with the other YSA elders who live with us and met the rest of the district there. There is always such a sweet spirit there, it's amazing! We received some great news on Sunday about our investigator from El Salvador named Elmer! We met with him after church and had a baptismal interview for him. He is SO ready! 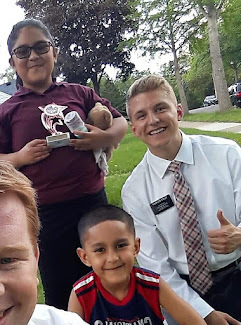 He faces lots of opposition at school, but he is so grateful for the testimony that he has already gained and looks forward to being baptized in the New Brighton Ward! We had to move back his date due to some scheduling conflicts, but we now have it set in stone for March 18th and we could not be more excited for Elmer! This week it just felt like everything came together, we have Elmer’s baptism set and we now can fully prepare for that. We also had some awesome miracles with church attendance! Four less active families that the missionaries have been working with for several months all came for the first time in months! So cool to finally see a full Spanish Sunday School class! It was incredible to finally see all our efforts pay off. I just want to let you all know how grateful I am for each and every one of you. I can feel all your prayers which help strengthen me and help us with the work here in New Brighton! I have felt so much happiness this week and have been able to feel the hand of the Lord helping me press forward. We have been blessed immensely this week and I'm so excited for these next upcoming weeks! Always remember that our Heavenly Father is there for us, all we need to do is call upon him in sincere prayer!